I recently signed up to a meal planning site http://www.foodonthetable.com . Its recipes are limited as it's still new, and they also want you to pay the monthly fee to get more recipes. I signed up mainly because I wanted to eat healthier, and spend less time dicking around in the kitchen. I am not a cook by any means. Thus far, the dishes I've made have turned out to be very tasty, and all were easy to make. 1. Preheat oven to 425 F and set pot of water to boil for pasta. 2. Arrange shrimp in a single layer in a 13x9-inch baking dish coated with cooking spray. Combine lemon juice, garlic, cayenne, lemon-pepper seasoning, olive oil & soy sauce; pour over shrimp. Bake at 425 F for 8 minutes or until shrimp are opaque. 3. 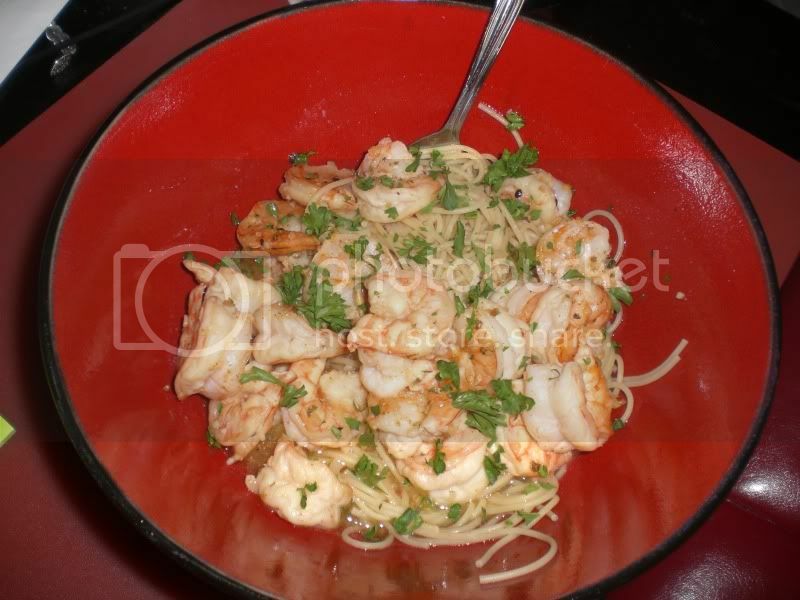 Serve shrimp & pan juice over the pasta. 4. Sprinkle chopped parsley over dish. Took 5 minutes to prep, and another 5 minutes to clean up afterwards. But that looks really good, I'm going to make that for dinner tomorrow night. The de-veined and un-shelled frozen shrimp are the best deal. I bought mine in a 2lb bag on sale for $8.99. Buying them fresh from the seafood case will always cost more per pound. I'm willing to "shell out" (smug grin with successful pun) a little more for fresh shrimp. After all, it's fresh seafood! Done in 20 minutes (if the pasta needs to be cooked) otherwise 10 minutes. It will fill you up and its also pretty healthy and its super tasty. Ok, so I had to get a new physical now that I am 40. It seems that my cholesterol and triglycerides were a little 'high.' I BBQ A LOT. I don't know if meat is murder but it may be suicide. So I have really had to make a few changes. I am quite the foodie so I refuse to eat bland food. Mostly I have been doing a lot of Mediterranean food. Flat bread and extra virgin olive oil has been a starter and side dish for over 2000 years. Add a bit of sea salt to the EVO for extra flavor. Mix together, heat an serve. For added effect, you can saute the clams in olive oil and garlic. Take fresh garlic, slice it thin, and brown it in olive oil. Then add the clams and cook them just a bit. Do not over cook or the clams will be tough as erasers. You can add a bit of butter to the olive oil for flavor if you like. Also try adding 1 cup red wine ( a fine chianti, of course) right after putting the clams in the oil. For a more hearty soup try adding a cup of rotini to the soup. Generated in 0.034 seconds of which 0.015 seconds were spent on 19 queries. Zlib compression disabled.